So happy with this comforter - the material is comfortable and the colors are beautiful. Bring a touch of charm and style to your bedroom with the Waverly Brighton Blossom Reversible Comforter Collection. This statement collection features an allover Jacobean floral in rich jewel tone colors. Reverse features coordinating basketweave-inspired print. Shams are fully reversible with hidden zipper closure. 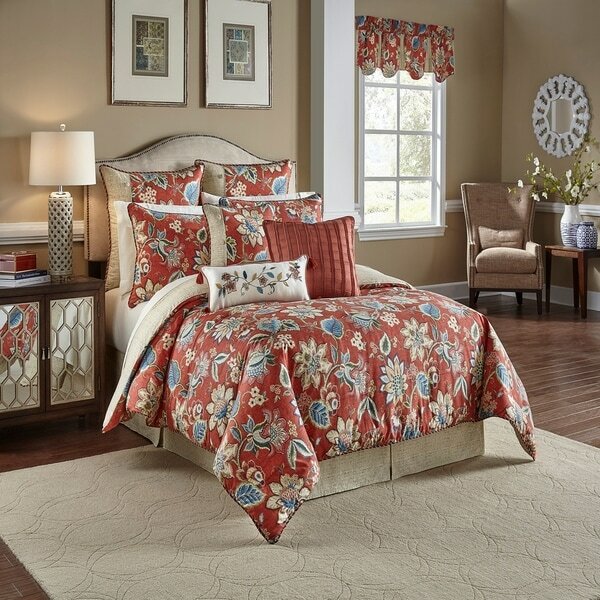 Comforter set includes one reversible comforter, one coordinating bed skirt, and two coordinating pillow shams. Queen comforter set features a 92" x 96" reversible comforter, two 21" x 26" reversible standard shams, and a 60" x 80" tailored bed skirt with 15" drop. King comforter set includes a 110" x 96" reversible comforter, two 21" x 36" reversible king shams, and a 78" x 80" tailored bed skirt with 15" drop. The comforter, shams and bed skirt are machine washable for easy care. Machine washable. Complete your designer look by layering on coordinating accent pillows and lined window treatments, all sold separately. Dimensions 96.0 In. X 92.0 In. Colors were just as described. Nice and bright. The fabric is okay but could have been a little more substantial for the price of the item. Shipping was super quick! The quality is great and the colors are vibrant. Bought the entire collection the bedding set, euro shams, and the two extra pillows. I've received many comments on the newly decorated room already. Lovely set to add some color to our sort of plain bedroom. I’m a little disappointed that the pillow shams are so small. These won’t cover the top portion of the bed. Makes it look awkward and unfinished. I really didn’t want to have more pillows on the bed as then these wind up on the floor which is a tripping hazard for us at night. But mostly the quality is worthy of Waverly. Lovely set, with warm, vibrant colors.This set makes the room look fresh and inviting. I love that it is machine washable. Our last set had to be dry-cleaned, which becomes expensive. Like others have mentioned , the basic color is different than the picture portrays. Much more orange than red and unfortunately I do not like orange! It is still ok and because they charge to return, I will keep it for my guest room. Not real clear on quality as not washing. Did think it was nice that the shams have a zippered opening so pillow always stays put. I gave it a 4 only because it looks ok though the fabric is just so-so. I had been looking at this comfortor set for a while and wanted a King size but waiting for it to go sale which it did. It's beautiful, colors so bright which is what I wanted. I would recommend this to anyone! If you think the colors are pretty online, wait till you get it home! The rich colors would brighten your living room or bedroom! Love this set! It's kind of a brick red, but it's a great pop of color in our guest room! Bedding seems to be of a good quality but the color is not exactly like the picture, but is still pretty. Love the colors, and have seen this product and find the quality good. "Would you describe the bedspread's main color as a ruby red or is it more of a brick/orangy red?"